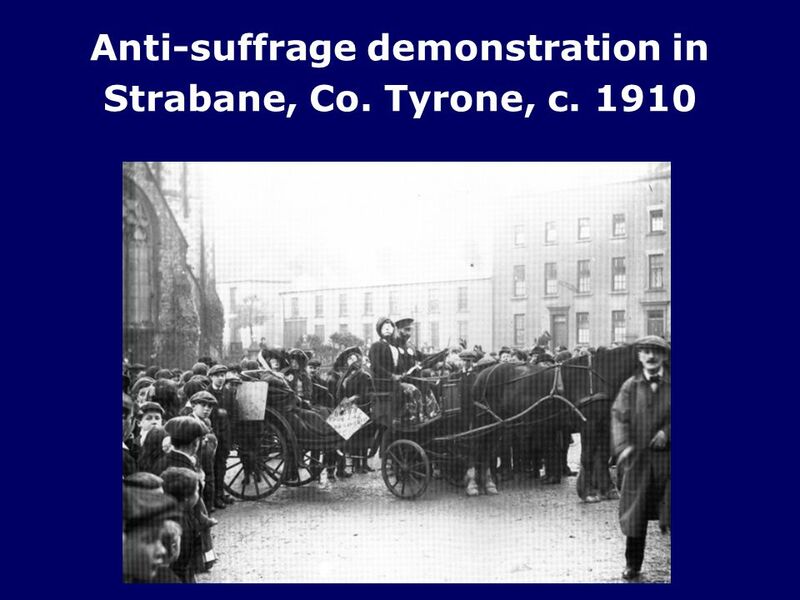 2 ‘A significant minority of Irish women had become increasingly articulate and active in feminist, nationalist and labour concerns. 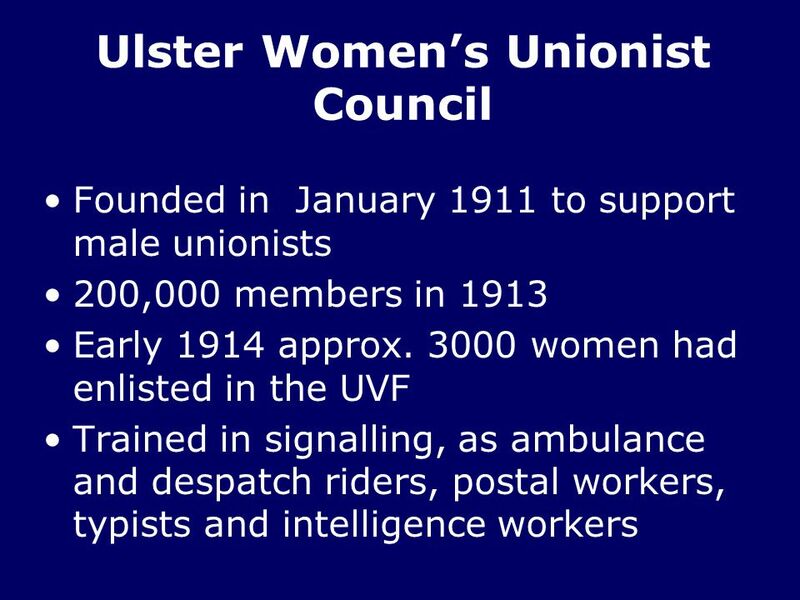 To the number of nationalist women involved before and during the Rising of 1916, many thousands more were added in the wake of the Rising. 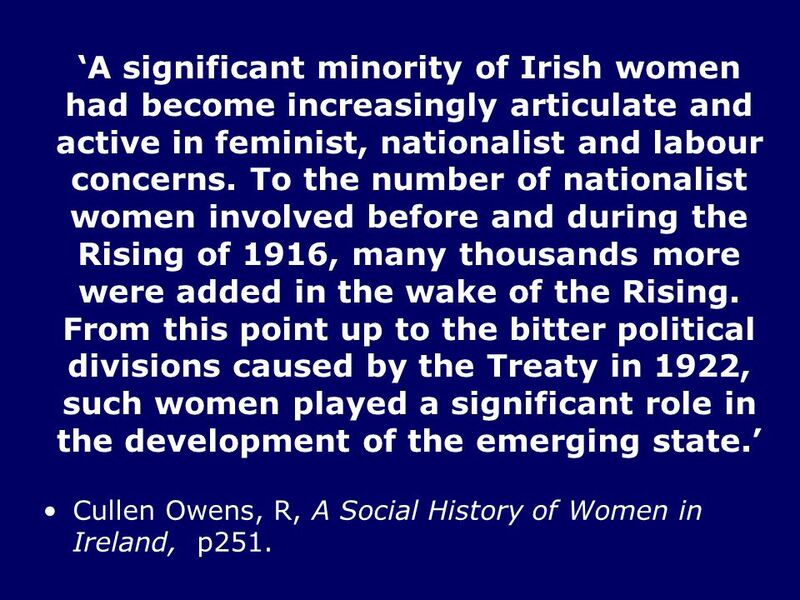 From this point up to the bitter political divisions caused by the Treaty in 1922, such women played a significant role in the development of the emerging state.’ Cullen Owens, R, A Social History of Women in Ireland, p251. 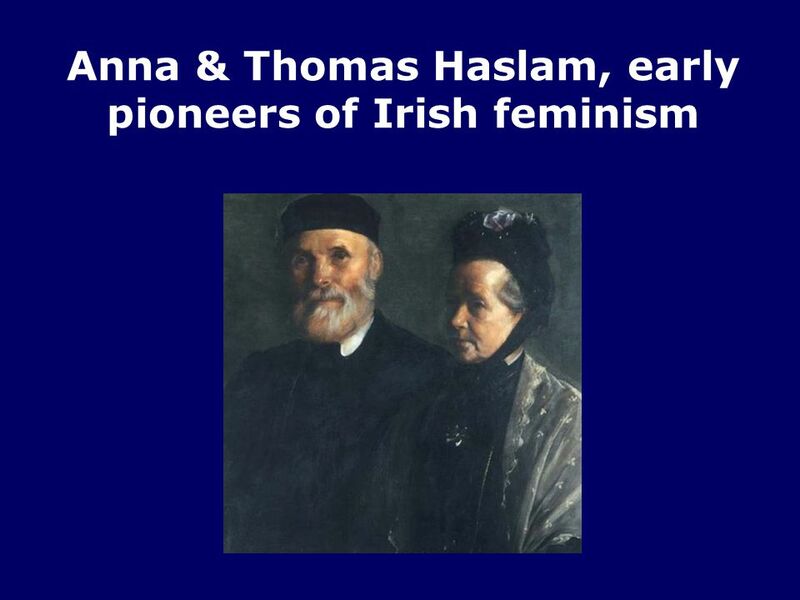 3 ‘It is generally assumed that nineteenth-century Irish politics were a function of public life, a male activity in which women played little if any role. 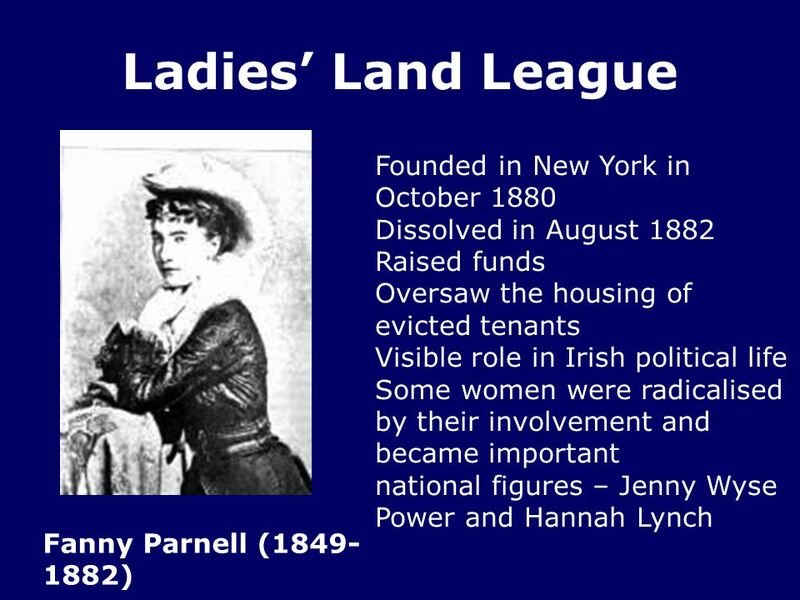 Political historians pay scant attention to the role of women in political life, seeing it as either peripheral, or of small consequence. 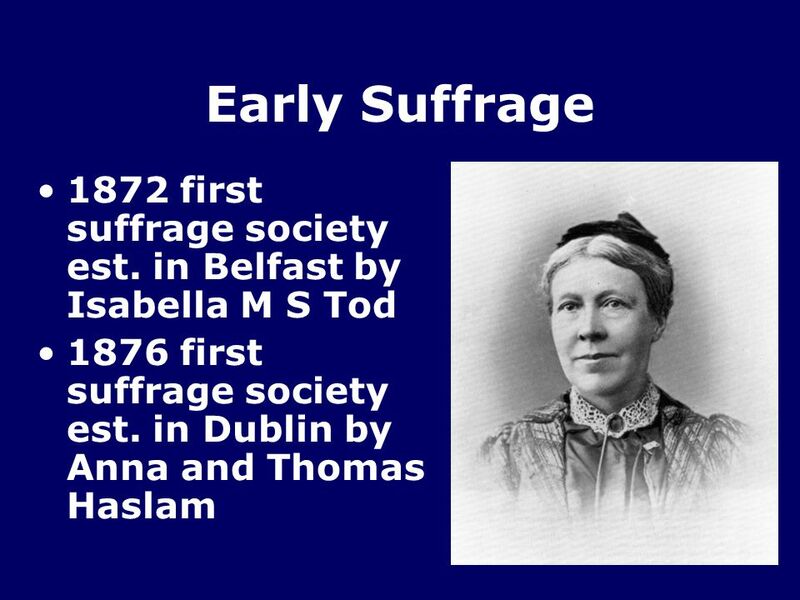 Women, of course, were not voters, nor did they have access to high political office in the nineteenth century. 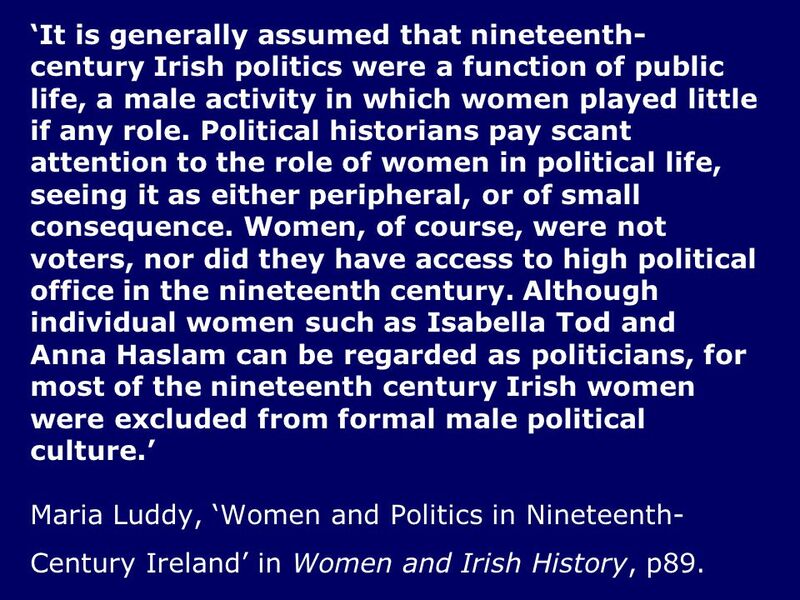 Although individual women such as Isabella Tod and Anna Haslam can be regarded as politicians, for most of the nineteenth century Irish women were excluded from formal male political culture.’ Maria Luddy, ‘Women and Politics in Nineteenth-Century Ireland’ in Women and Irish History, p89. 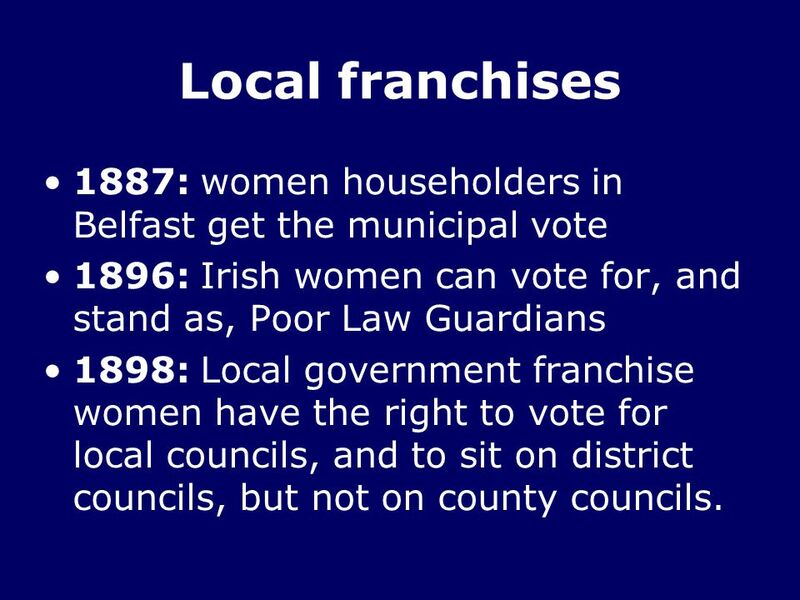 6 Local franchises 1887: women householders in Belfast get the municipal vote 1896: Irish women can vote for, and stand as, Poor Law Guardians 1898: Local government franchise women have the right to vote for local councils, and to sit on district councils, but not on county councils. 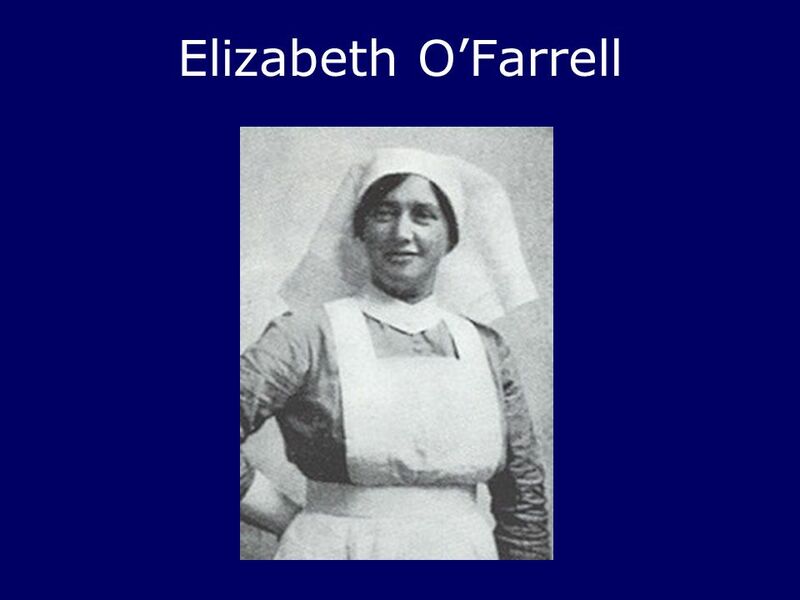 14 ‘I had a good deal of prejudice to overcome on the part of the parents, who did not mind their boys taking part in a military movement, but who had never heard of, and were reluctant to accept, the idea of a body of gun-women. 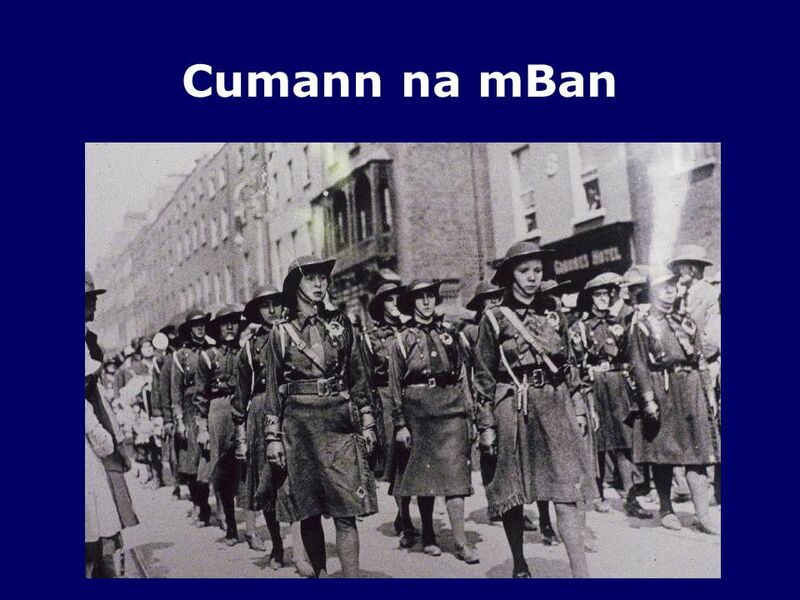 It was, of course, a rather startling innovation and, in that way, Cumann na mBan can claim to have been the pioneers in establishing what was undoubtedly a women's auxiliary of an army. 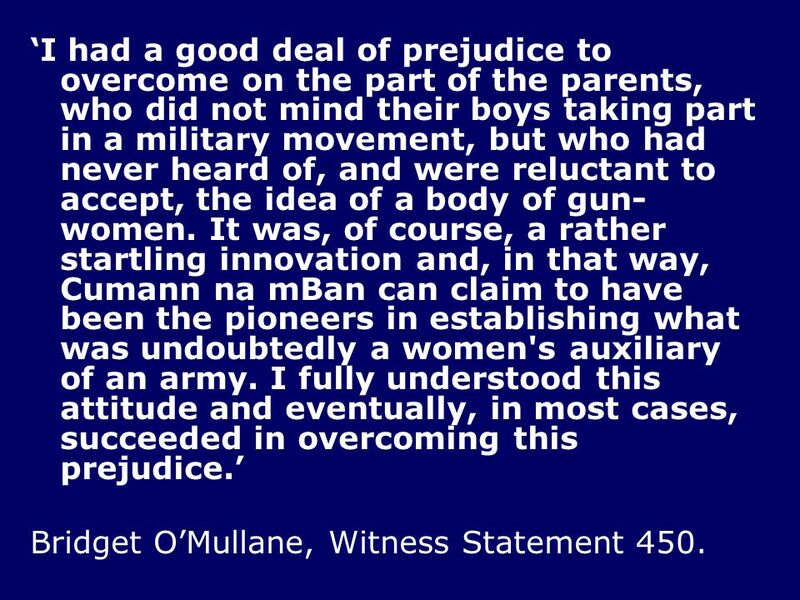 I fully understood this attitude and eventually, in most cases, succeeded in overcoming this prejudice.’ Bridget O’Mullane, Witness Statement 450. 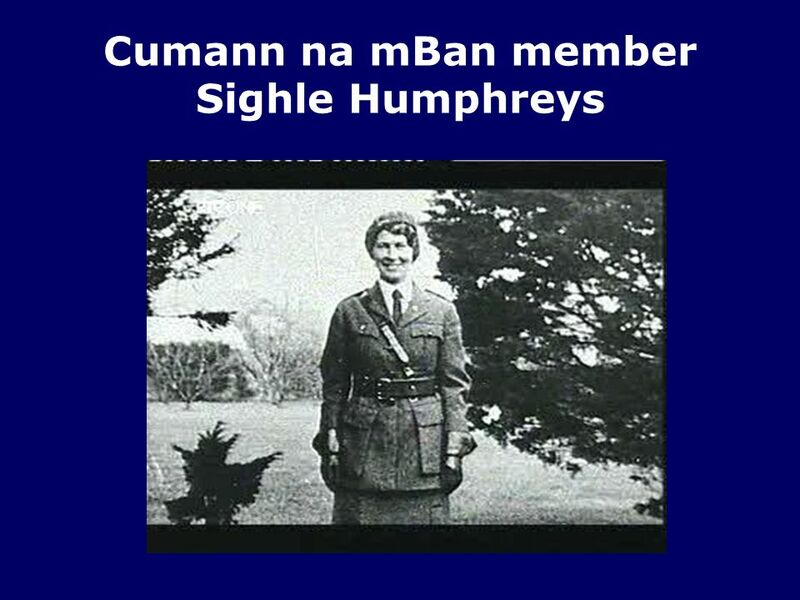 Download ppt "Women in Irish Political Life"
UNIONIST OPPOSITION TO HOME RULE Mr. P. Montgomery. 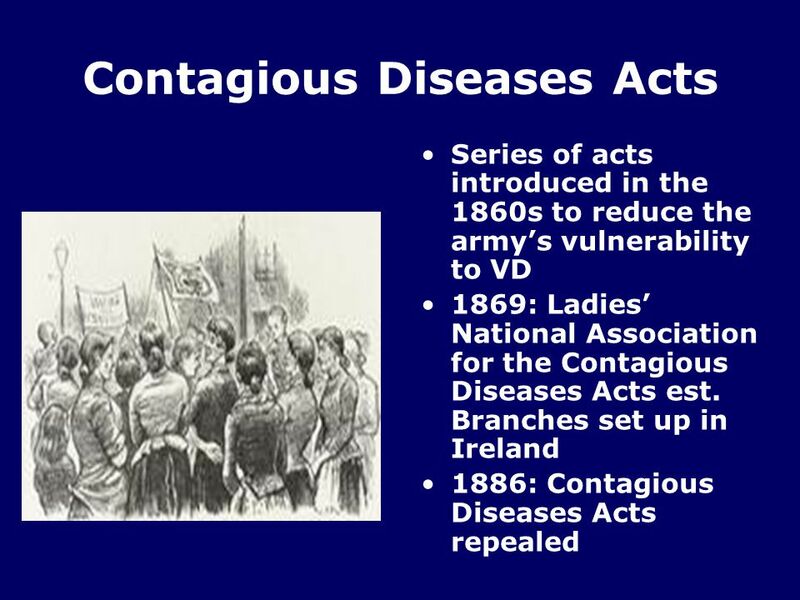 CONTESTING HISTORY OPPOSING VOICES 15: Permissive Society or Just Society? 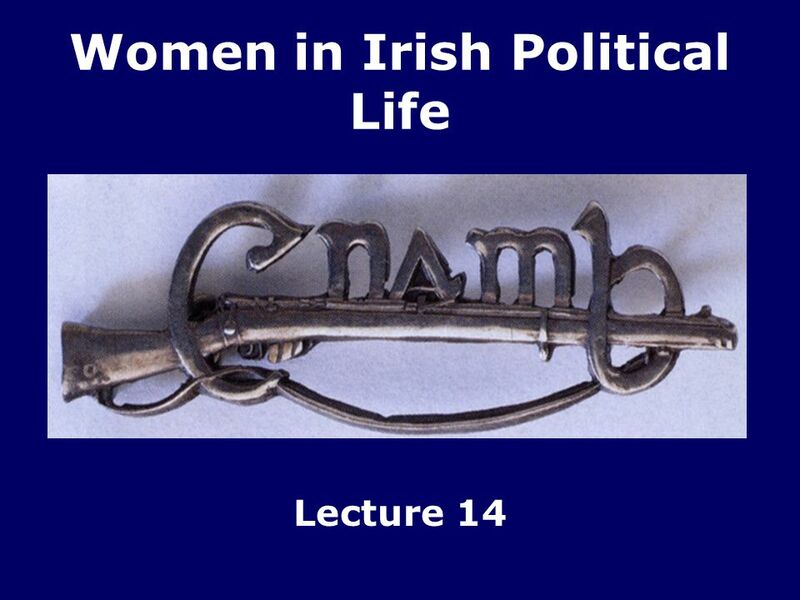 Women and Politics in Ireland, ? GCSE MODERN WORLD HISTORY GCSE MODERN WORLD HISTORY BRITAIN INTERACTIVE BRITAIN INTERACTIVE How far did British society change between. 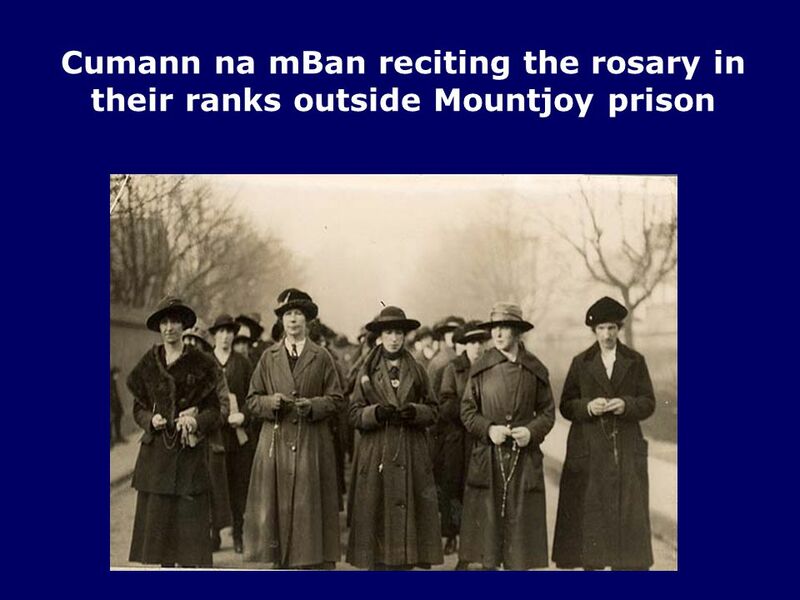 Fighting for whom – 1916? Introduction Other visual sources Jason Brierley, St George’s CoE High School ‘Ireland in Schools’ BPS SIS, Blackpool. 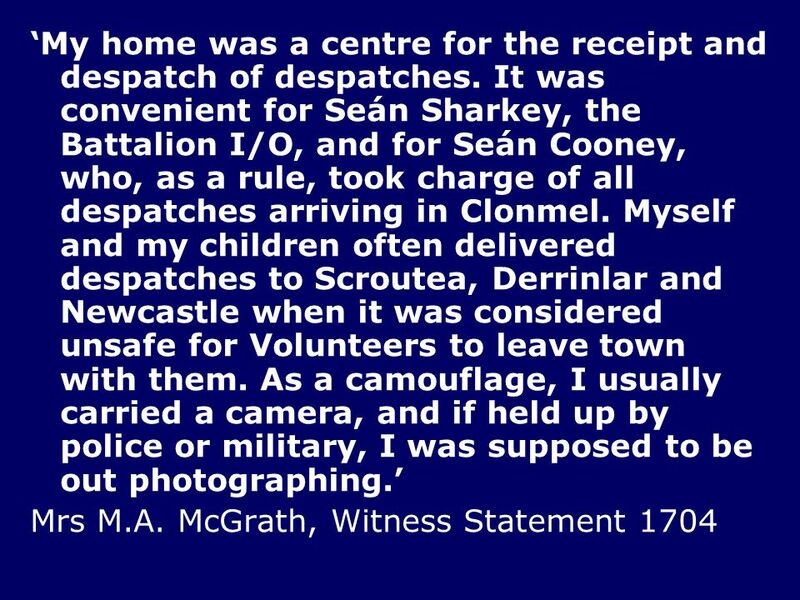 Ireland Post 1900 Leaving Cert History. 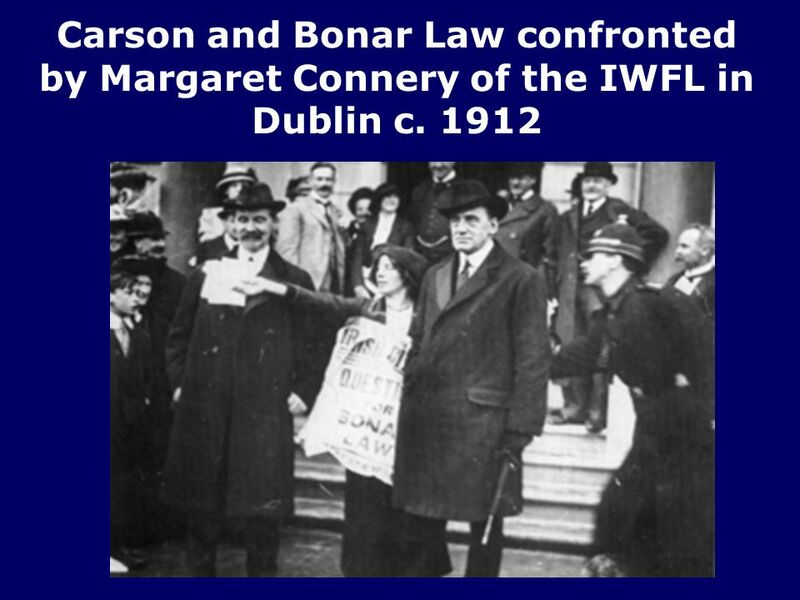 Poor family A printer Joined Gaelic League and IRB Believed in ‘inclusive nationalism’. Nationalism a commitment. CONTESTING HISTORY OPPOSING VOICES 9: Nationalism and Socialism: The Lockout and the Rising. Women’s Rights In America By B.B.. Background Information Women’s roles in Early American History, or any country's history, has often been. James Byrne 6 th Class. ◦ Introduction ◦ Why did the Rising happen? ◦ What happened ? ◦ Who was involved ? ◦ Where it took place ? ◦ Why was it an important. 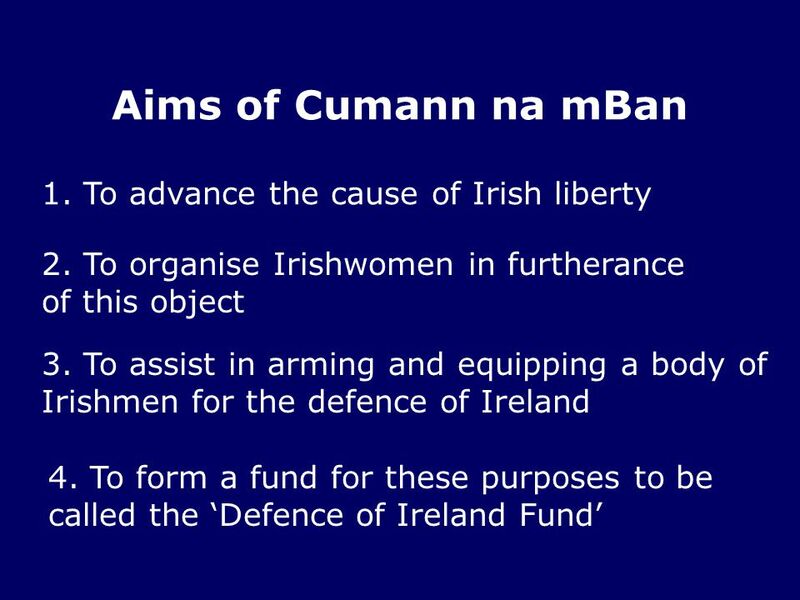 Objectives Identify the limits faced by American women in the early 1800s. 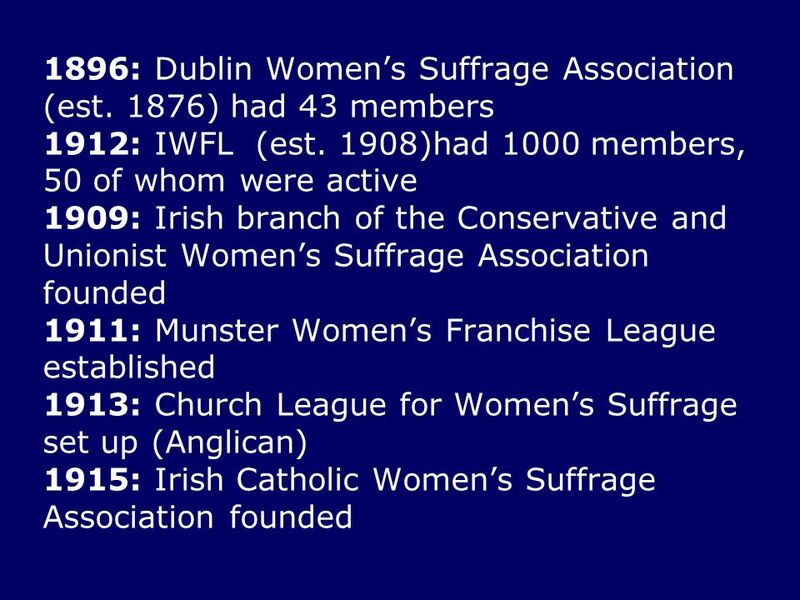 Trace the development of the women’s movement. Describe the Seneca Falls Convention. The Irish Question By Jakub Bína RAMZ. 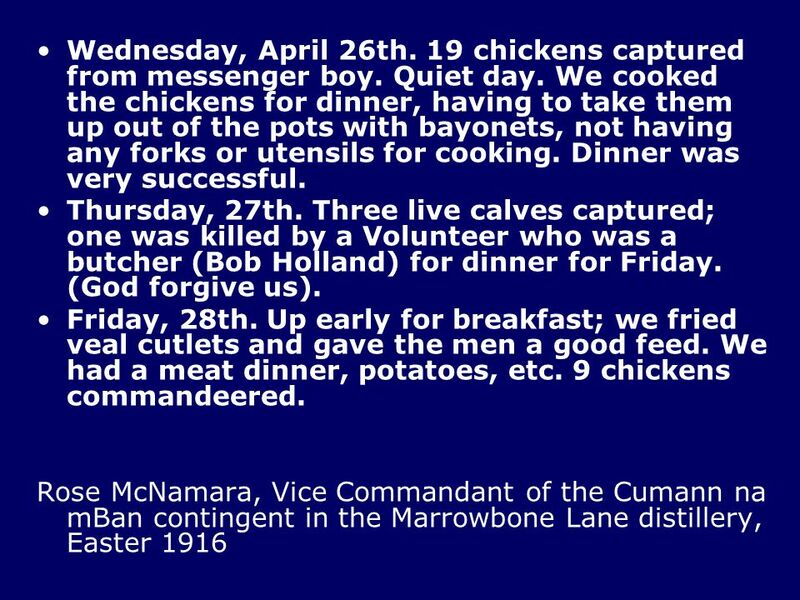 Ireland From the Potato Famine to Independence. © Marie-Christine Röhsner Early Irish History Iron Age: Celts/Gaels Iron Age: Celts/Gaels 432 St. Patrick.